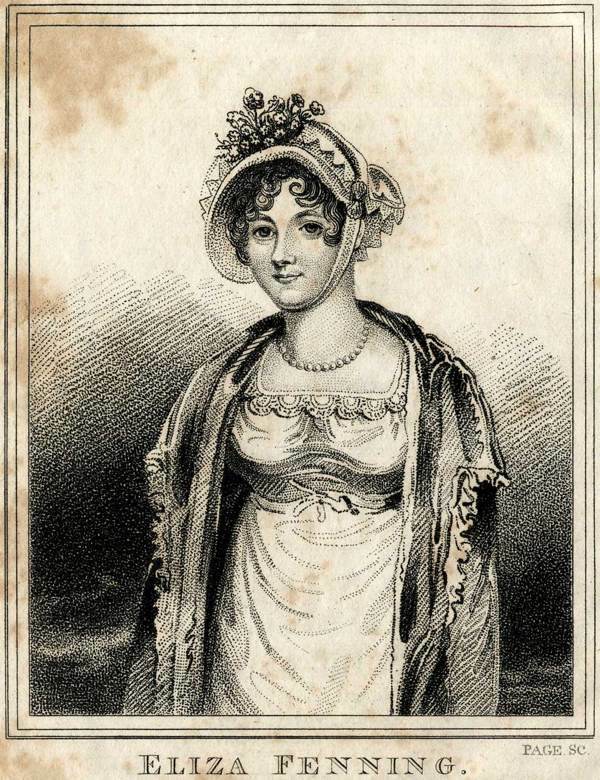 Between the publication of a print of the execution of Marie Antoinette in 1793 and an ABC of the Great Exhibition in 1851, the name of John Fairburn was synonymous with the production of vivid and popular sixpenny chapbooks in London. “This is English Folk Art of the best kind, dramatic and with a strong sense of good and evil – of ethics behind it,” curator Ruth Richardson assured me, when I went to take a look at the collection in the Bishopsgate Institute. And, while I was immediately entranced by the lurid and violent scenes tinted in such irresistibly gaudy colours, on closer examination it became apparent that beyond the voyeuristic fascination with extremes of behaviour, there was a certain human sympathy present – exposing injustice and drawing attention to the vulnerability of those at the bottom of the social pile. 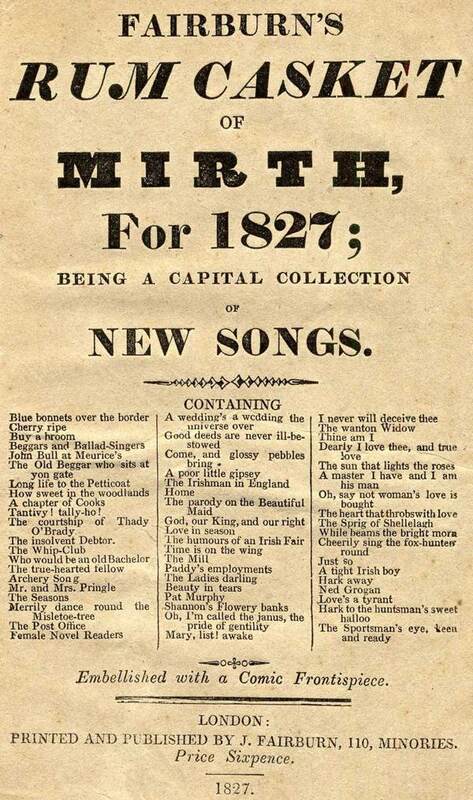 “All his work – without exception – was patriotic never seditious, but he was a supporter of democracy and what we would call ‘human rights,’ which he would call ‘the rights of man.’ He’s also quite clear about the equality of the sexes, supports Catholic emancipation, the abolition of slavery and stands against ill-treatment in the Navy.” Ruth explained, articulating the editorial policy that underlies Fairburn’s publications. 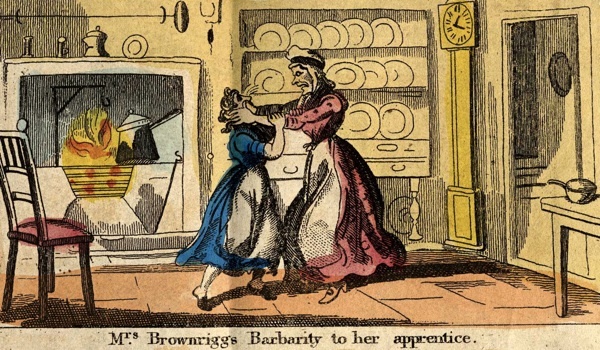 A recurring theme in these chapbooks is the abuse of servants and apprentices. 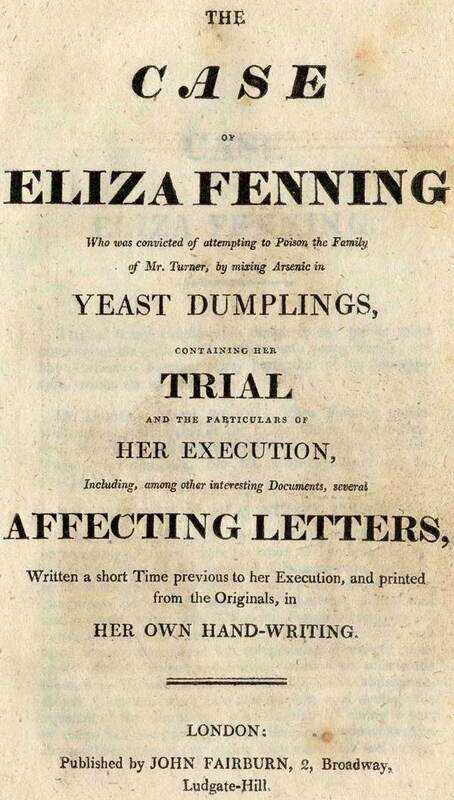 In particular, Eliza Fenning, a young servant of genteel manners who was executed upon the accusation of attempting to poison her employers with arsenic in the dumplings, which she also ate. She declared her innocence and retained dignity even to the scaffold. 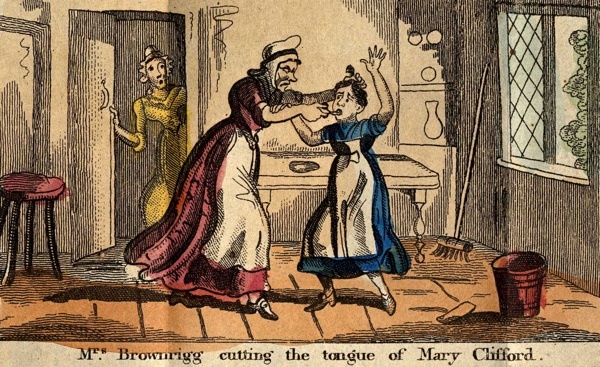 It was subsequently discovered that a psychotic relative had previously threatened to poison the family, but then it was too late for Eliza who – as a servant and therefore the person of lowest moral worth in the household – had taken the fall. 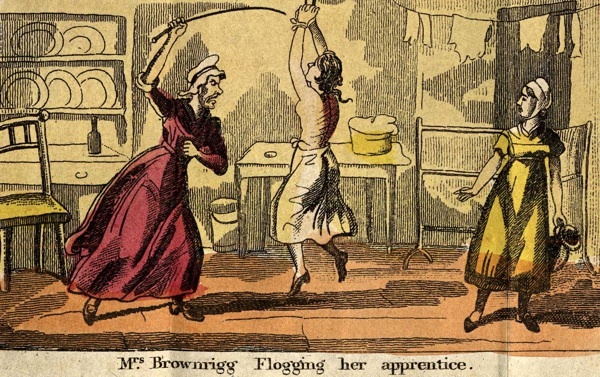 Other cases report examples of those who, apprenticed from the workhouse by sadistic employers and denied any protective monitoring, became subjected to horrific abuse. 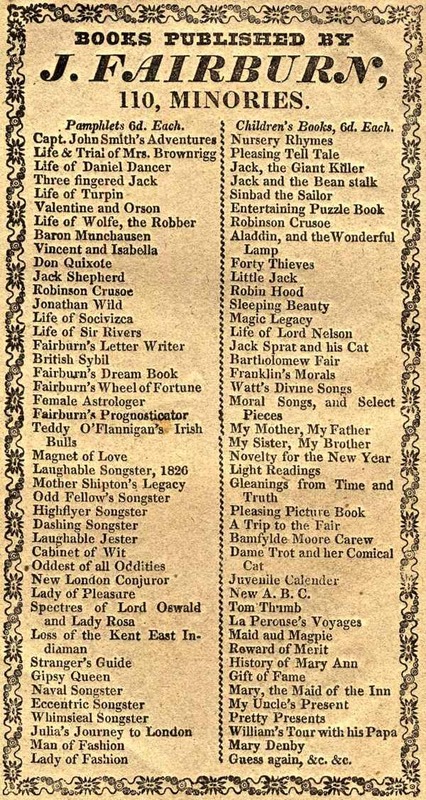 Charles Dickens loved Fairburn’s chapbooks and Ruth believes that he may actually have worked for Fairburn undertaking some of these court transcripts which prefigure elements in his own work, most obviously the apprenticeship suffered by Oliver Twist. 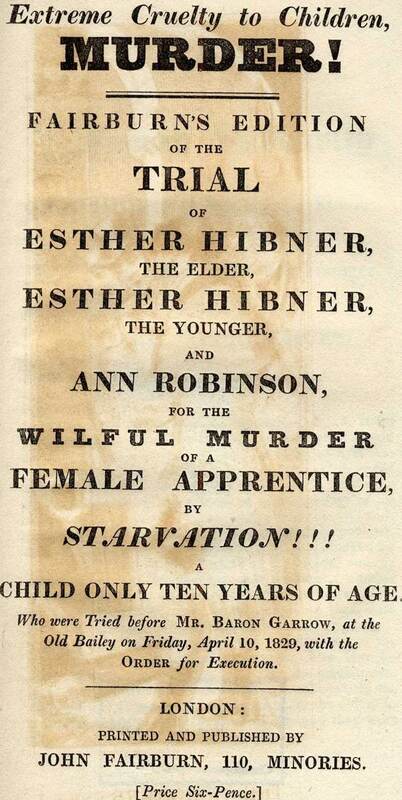 Transcript of the trail for the murder of servant Margaret Hawse, aged ten years, 1829. 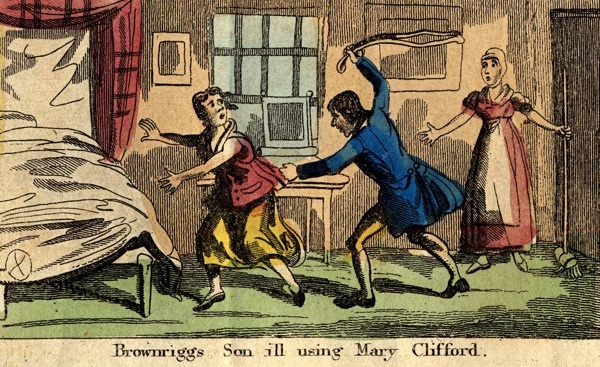 Transcript of the trial for the abuse and murder of servant Mary Clifford. 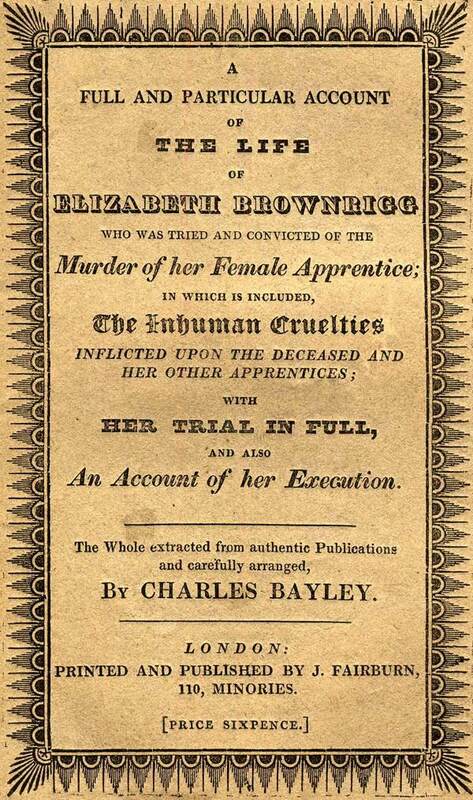 Mis-trial of servant Eliza Fenning, executed upon accusation of poisoning her employers. 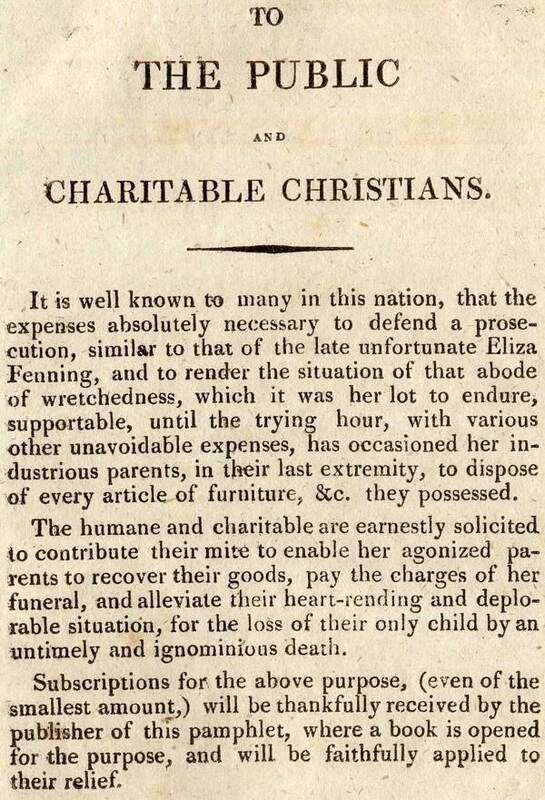 Appeal by John Fairburn on behalf of the parents of Eliza Fenning. 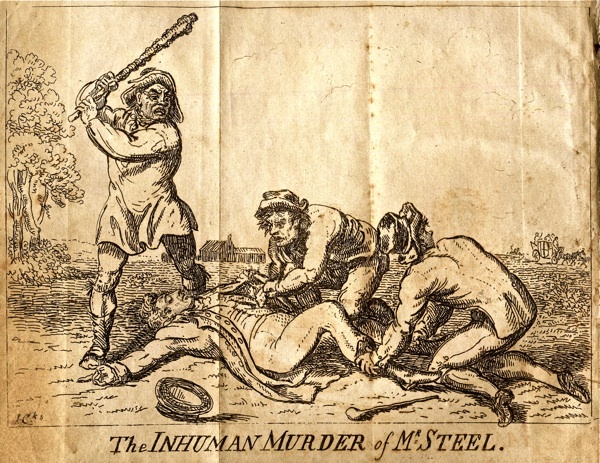 Illustration by Isaac Cruickshank (father to George) of the Murder of Mr Steele, 1802. 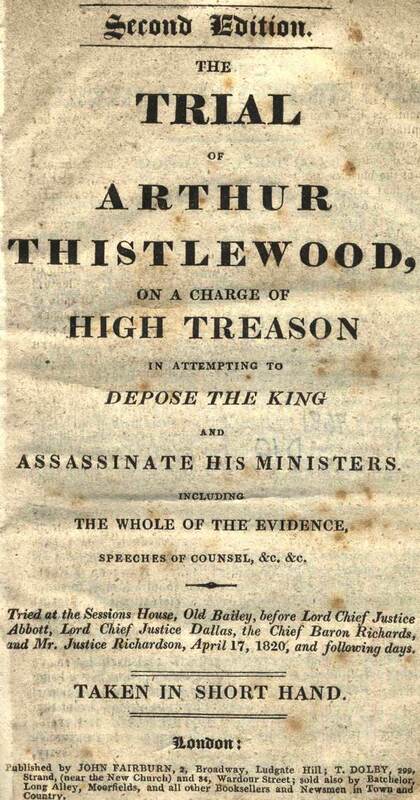 Transcripts of the trials of John Holloway and Owen Hagerty for the murder of Mr Steel and of Elizabeth Godfrey for the murder of Rd Prince, with an account of those trampled at her execution. 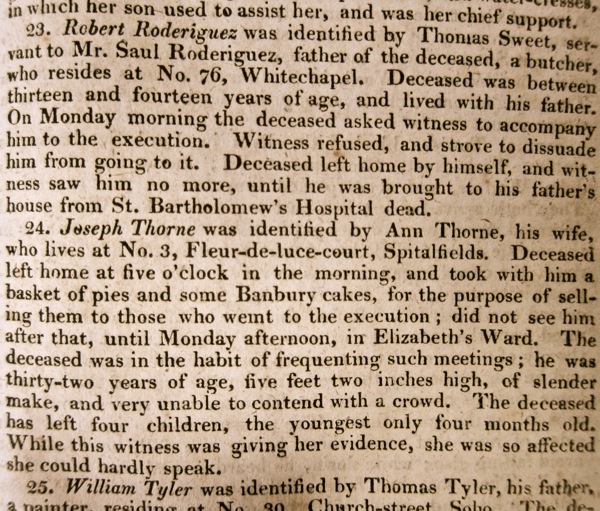 Two East Enders were among those trampled at Elizabeth Godfrey’s execution in 1807. 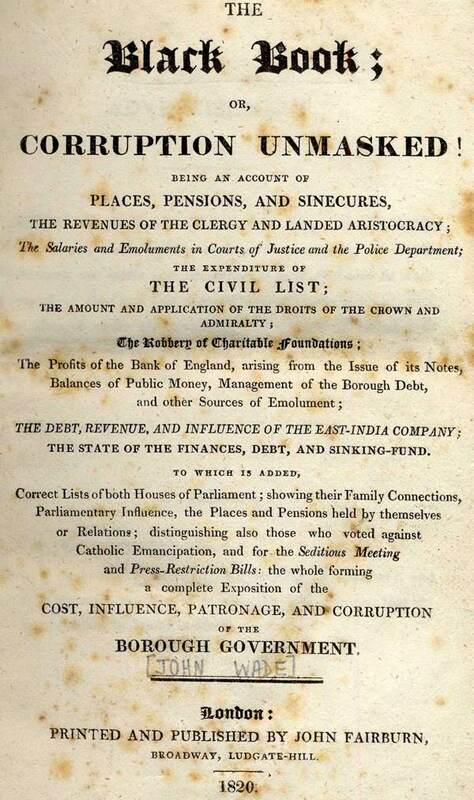 Exposure of corruption in Parliament and elsewhere. 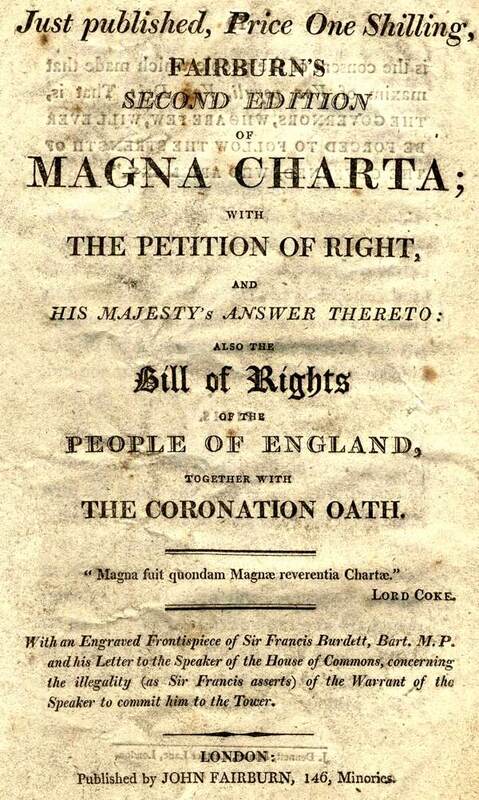 An attempt to assassinate the king. An exhibition of John Fairburn’s Chapbooks guest curated by Dr Ruth Richardson runs at Bishopsgate Institute Library until December. 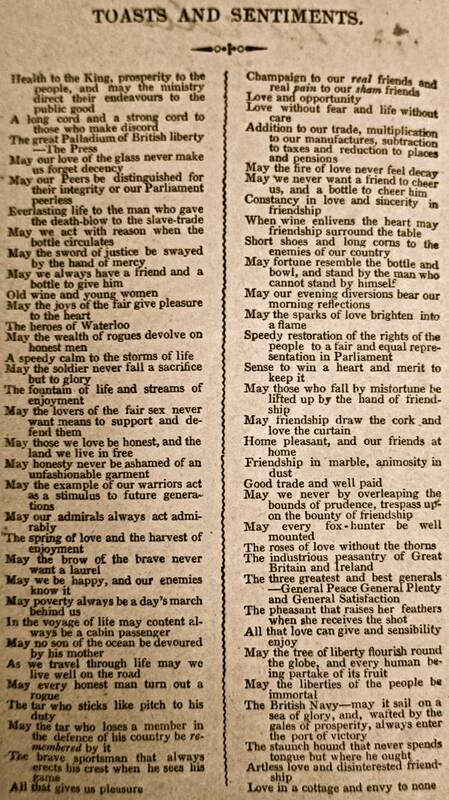 Marvellous to have these shared in this way. The little exhibition of the originals is indeed wonderful – but here you can see the illustrations clearly, and read the texts. Will definitely visit exhibition. 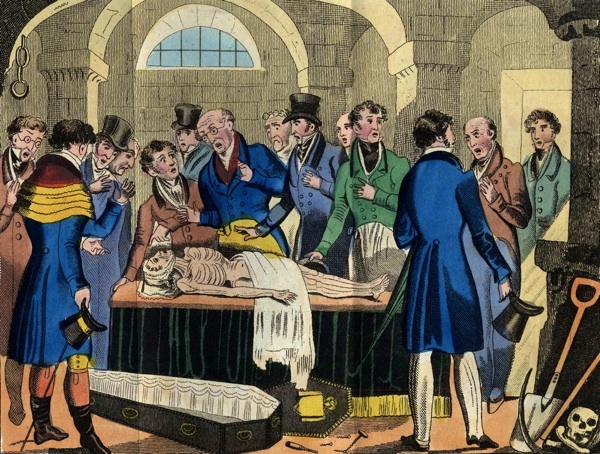 For more on John Fairburn, especially his forays into bawdy, subversive and obscene publications see Iain McCalman’s ‘Radical Underworld : Prophets, Revolutionaries and Pornographers in London, 1795-1840′ (1988) . The government’s spy system kept close tabs on him. It is heartening to see compassion shown to those without power and means.